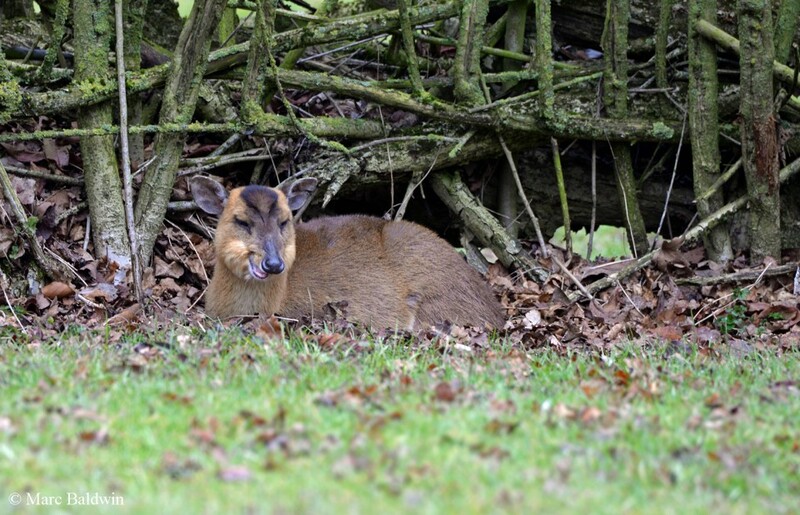 Deer are ruminants, which means that they “chew the cud”. Indeed, the word ruminant stems from the Latin ruminatus, meaning “to turn over in the mind” or “chew the cud”. Cud is thought to have roots in the Old English cwidi, meaning “what has been chewed”. Moreover, deer are poly-ruminant, which means that they have multiple (four) sections to their stomach. 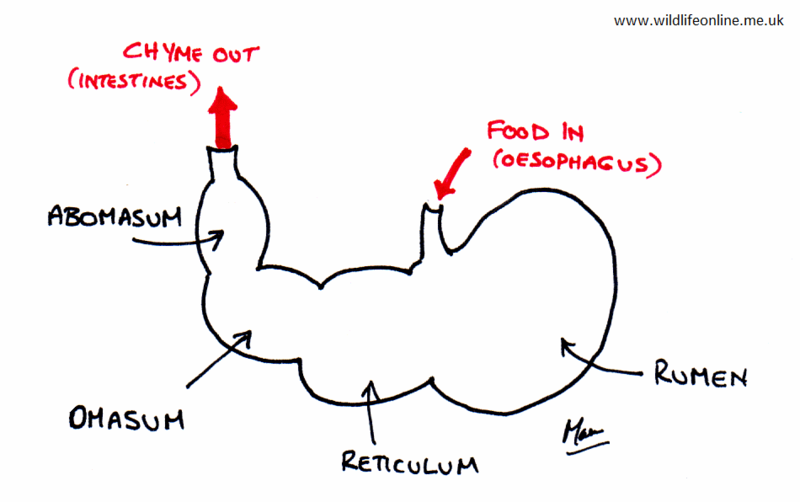 Starting at the oesophagus (throat), the chambers are named: the rumen; the reticulum; the omasum; and the abomasum, which empties into the small intestine. Food passes down the oesophagus into the rumen, where it sits and becomes mixed with microbes. An expansion of the chest produces a vacuum in the upper rumen and allows some of the plant material to be sucked back up into the oesophagus, where peristaltic movements force a clump of cud (called a bolus) up into the mouth. When in the mouth, the bolus is pressed against the roof by the tongue and excess water is swallowed before chewing recommences. 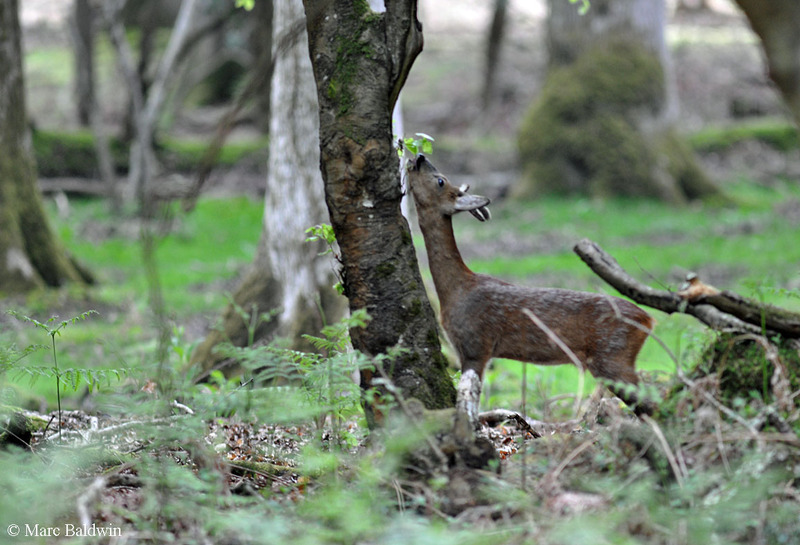 In his 2007 book Deer Watch, Richard Prior notes that cud chewing seems to be a relaxing activity for deer; they lie with eyes half-closed and a slight hiccup and ripple in the throat signals the re-arrival of a ball of food. Deer possess a brachyodont dentition, whereby the molars have low or short crowns and well-developed roots. In each side of a deer’s jaw the three incisors and (in most species) canine are separated from the three premolars and three molars by a large gap; the crowns of the upper teeth fit neatly into the teeth of the lower jaw. The tooth arrangement, coupled with adaptations to the jaw musculature allows the lower tooth rows to move across the upper ones such that deer chew with a sweeping grinding (side-to-side) motion. This ensures the plant material is ground against the ridges of the molars and premolars (collectively termed the “cheek teeth”). The cheek teeth break up the cell walls, releasing the digestible contents, while the large molars serve as a mill on which to grind plant material into fine particles. The food is then re-swallowed. The grinding process serves to increase the surface area of the plant material available for the microbes in the rumen to work on, while the act of chewing stimulates saliva that acts as a buffer to the acid in the rumen (which must be kept within fairly tight limits of pH). At the same time, microorganisms are regurgitated with the cud and so become more thoroughly mixed with the digesta as it’s chewed. The process of chewing the cud also increases the effective length of the digestive tract, meaning that the microbes have longer to breakdown the plant material. Despite all this, overall, very little actual digestion takes place in the rumen (it is primarily a holding tank), although a reasonable amount of fatty acids are liberated from the food here; some authorities estimate that as much as 40% of the deer’s energy may be obtained by absorption of fatty acids and sugars from the fermentation of cellulose through the rumen wall. Upon leaving the rumen, partially digested food (called chyme – pronounced “kime”, from the Greek chymos, meaning “juice”) passes into the reticulum, where it's strained. (It should be noted that the rumen and reticulum are considered the same functional space, because material can move back and forth between the two. For this reason, they are sometimes collectively referred to as the reticulorumen.) The reticulum lining is covered with a framework of ridges, forming a honeycomb pattern and serving to increase the surface area over which volatile fatty acids can be absorbed. The reticulum is effectively a fermentation vat, containing what Rory Putman describes as “a murky suspension of tiny food particles and micro-organisms” in his The Natural History of Deer. Within the reticulum sits the ruminal mat; a thick mass of partially-digested fibrous material. As material is regurgitated and re-swallowed, there comes a point where the particles are sufficiently small and dense to pass down through the mat into the ventral sac and from there through the reticulo-omasal orifice into the third section: the omasum. The omasum has a heavily-folded lining allowing for between 60% and 70% of the water to be absorbed, along with inorganic minerals such as magnesium, and any fatty acids that made it through the reticulorumen. It seems that larger particles can be pushed back into the reticulum for further digestion, should they make it through the reticulo-omasal orifice. From the omasum, the chyme moves into the fourth, and final, chamber: the abomasum. It is in the abomasum that the majority of digestion takes place and where gastric juices, including hydrochloric acid, are secreted. This section is often referred to as the “true stomach” because it is the equivalent of the stomach in monogastric animals, such as humans. As such, the digestion of fats, carbohydrates and proteins progresses as it does in other vertebrates and the products are sequestered into the bloodstream. The epithelium (lining) of the abomasum has gastric pits called “foveolae” with gastric glands underneath them; these contain hydrochloric acid-producing parietal and zymogenic cells that make digestive juices, similar to our stomachs. The majority of saccharides, amino acids and peptides in the abomasum are taken up by the microorganisms doing all the work in the rumen and put towards their growth and multiplication. As the microbial population grows, some invariably get washed out of the reticulorumen with the chyme, where they’re killed by the abrupt change in acidity and are digested – it is estimated that up to 90% of the animal’s amino acids are obtained in this way. The digestion of microbes is also an important source of glucose in starch-poor diets. 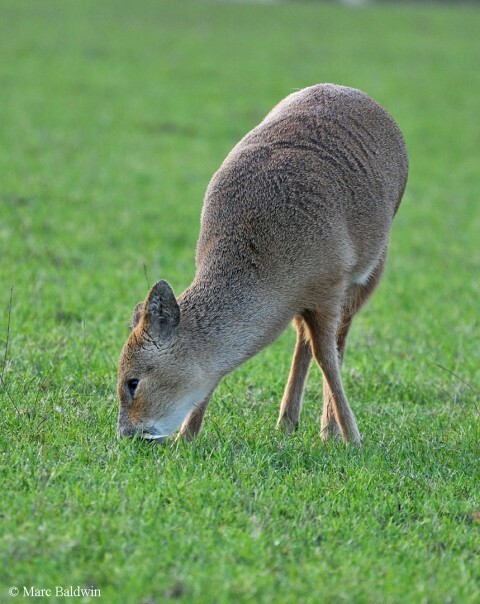 Consequentially, deer are sometimes said to ‘farm’ microorganisms, obtaining their essential amino acids by digesting them as they leave the reticulorumen. The food finally passes out of the stomach and into the small, and then large, intestine where further digestion and absorption takes place. Why do deer need such an elaborate digestive system? Well, unsurprisingly, the answer lies in the type of food they eat: plant material. No mammals are able to efficiently break down plant matter; we don’t have the correct enzymes for the job. Consequently, when we eat fruit and vegetables, all we can get out are ‘goodies’ in the liquid contents of the cell. Unfortunately, this represents only about 20% of the total energy contained in the material because most is bound within the fibrous cell wall. The cell wall of plants consists of four main compounds: cellulose; hemicellulose; lignin; and pectin. To get at this energy (proteins, fats and sugars), we need to be able to break down both the tissue itself and these four organic polymers that make it up. The problem is that, while the tissue itself can be broken down fairly effectively by chewing, the polymers are ‘tough’ and not at all easy to digest. As we have seen, deer and other ruminants maintain populations of microorganisms in their stomachs, which can breakdown the cellulose and other structural compounds to release fatty acids, amino acids, peptides, sugars and various simple nitrogenous compounds (e.g. ammonia) that the deer can absorb and use for energy. Using microbes in this way is referred to as syntrophism. This syntrophic arrangement with the bacteria and protozoa make ruminants some of the most effective animals on the planet at converting the polysaccharides (long-chained sugars) in grass to protein (meat). So effective is the process that ruminants can access between 50% and 60% of the total energy contained within the plant material. What this means in practice is that deer are able to take advantage of nutritious young herbage, but are also able to make the best of even low quality forage. Obtaining essential amino acids, vitamins and minerals via digestion of microbes means that ruminants can ‘divvy up’ resources to a much finer scale, allowing species to specialise on a narrow range of plants. Additionally, by making use of a storage vat (the rumen), deer can eat considerable quantities at a single sitting and retire to a safer spot to digest the meal. The process of rumination is certainly a good way of utilising the energy available in the structural tissue of plants; but it’s not without its disadvantages. Efficient utilisation of cellulose takes time; to get access to 60% of the bound-up sugars may take up to 80 hours, which means the animal must feed almost constantly and is therefore often forced to accept low quality forage. High quality browse/graze is likely to be patchy, its availability varying seasonally, and with digestion times of this length the animal can’t afford to spend the time searching for it. Deer typically have small rumens, which allows for faster digestive throughput, meaning they can feed less often and spend more time searching out good quality food, but at the price of a less efficient digestion of cellulose. As we shall see in the gut flora/fauna section, a further disadvantage of this type of digestive system is that it becomes highly food-dependent – the microbial community in the stomach is tailored to digest specific types of plant material, which means that deer cannot rapidly switch foods.